FAMILY VIOLENCE IS A NATIONAL EMERGENCY IN THIS STATE AND ACROSS AUSTRALIA. THERE IS AN URGENT NEED FOR CHANGE. Now in its fourth year, Victoria Against Violence – which coincides with the global 16 Days of Activism Against Gender-based Violence campaign – calls on all Victorians to commit to actions that change the culture that drives family violence. Free from violence fulfils Recommendation 187 of the Royal Commission into Family Violence. It is a key priority of the government’s 10-year plan to reform the family violence system under Ending family violence: Victoria’s plan for change. The Prevention of Family Violence Bill 2018 (the Bill) was introduced to the Victorian parliament on 20 June 2018. The Bill will establish Respect Victoria – an organisation dedicated to preventing all forms of family violence – as a Statutory Authority. Establishing Respect Victoria as a Statutory Authority will fulfil Recommendation 188 of the Royal Commission into Family Violence. The scope of this strategy is primary prevention – preventing violence before it starts by focusing on settings where inequality and violent behaviour are shaped. An effective primary prevention approach reduces pressure on other parts of the system responding to family violence and violence against women, including early intervention and crisis response. Orange is the universal colour representing a global movement to end violence against women. Inspired by the penalty system in soccer, the #OrangeCard is a social platform designed to give Victorians a way to speak up, speak out and become a genuine part of the solution to family violence. By calling out real life examples of gender inequality, marginalisation and discrimination with the #OrangeCard we can change the conversation. 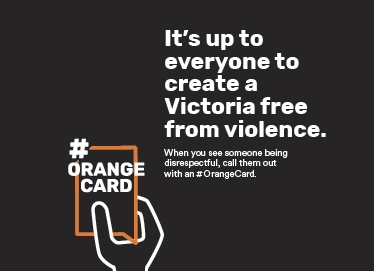 You can download a campaign kit with a wide variety of digital assets below to promote Victoria Against Violence across your social media platforms, workplaces and local communities. Take action now, because preventing family violence is up to all of us. The official launch of Victoria Against Violence will take place at The Colour Run, where we will paint the town orange, the universal colour to symbolise opposition to violence against women. Join us there; join us everywhere!